what about a new contest? I wanted to make a "small software development" company website design(of course the company doen't exist, it's just design), so it would be great if this contest will be about it without any Limitations... I mean colors, the stock photos, freeware icons etc. A company website !! 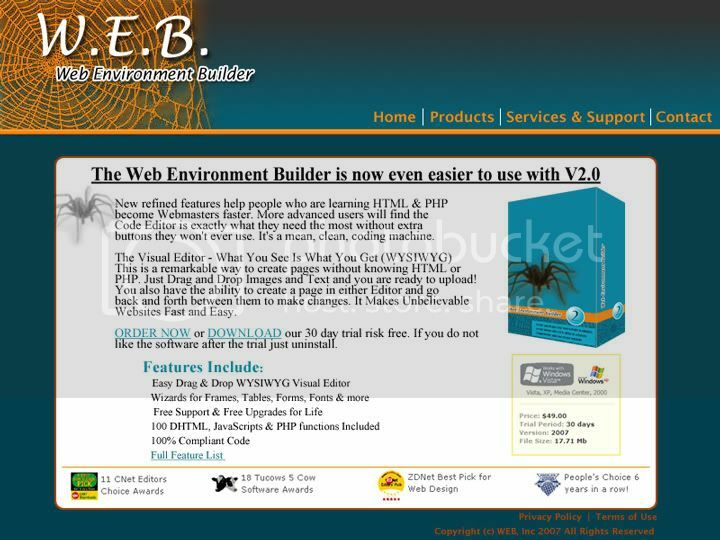 The sole product they're dealing with is a WysiWyg PHP editor, hehe... It's main feature is that it works like any other wysiwyg editor, you "draw/type/move things about" and then it works lie it's been coded by a pro. No voting must start before both contestants have entered their entries, and once entered, there is no redesigning... If posted that is your final entry !! Name of whom you vote for. Possible creative reasons - no trout in back of neck. If it needs to be smaller than I will make it smaller. You can right click on the image to see the full version. Hey Tarmy... as Patric said above in the "Rules"... no more posts. When you finish your Image for submission to the Contest... upload it to some server somewhere and post a link to it in your post here so that it displays in your post by Patric's deadline. That's it - That's all. After the deadline... as you see above... we all get to vote on the submissions. No one wants to vote? :rolleyes: There is only a day or so left. My vote goes for 4Sandrix. Besides a great design, his columns are simetric, fonts are far more easier to read. Colors he used make better contrast then colors on tarmithius13's template. My vote is for 4sandrix, his template looks better. I just thought that it would be unfair to post the finished template, so that's why it's doesn't look like as "WysiWyg PHP editor website".